One of the most common company documents we legalise is the certificate of incorporation. 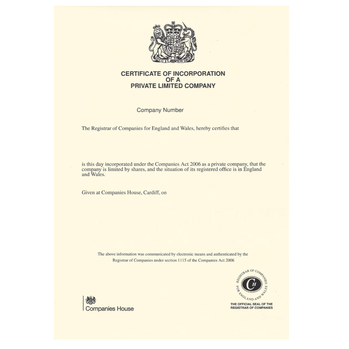 This document is used as evidence that your company is registered in the UK. For ONLY £66 we arrange for your certificate of incorporation to be issued with the apostille. Obtain the document if necessary. How to order an apostille for your certificate of incorporation? Simply purchase your apostille online and post or email your document to us. If you would like us to obtain the document on your behalf you can simply let us know the company registration number.